Malaysia customers, agents, has been a 5 year agent of a Chinese industrial washing machine company. As the goods they received from other supplier recently had some quality problems, they needed to find the new cooperation factory. At the end of August, the customer informed that there was no inquiry yet, but he need the quotation for reference, and then the quotation was made according to the customer's requirements. 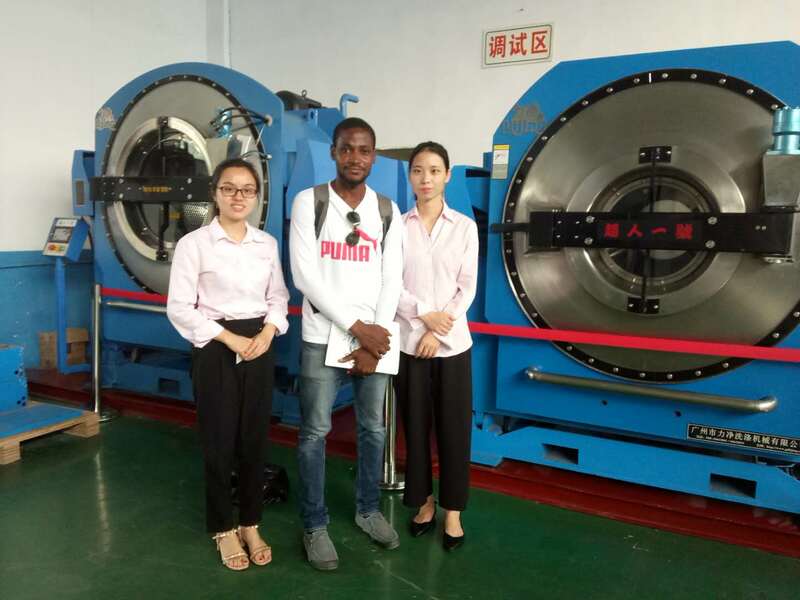 In the early September, customers said he was thinking of visiting our factory in Guangzhou. On Sept. 8, He come to our factory to check the machines. Our customers came from the maintenance department and have second-hand and renovated washing equipment of international brand. But Import the new machine from China. When the customer came to our warehouse, he was interested to see our machine and checked the main parts of all the products. The customer checks parts and machines for evaluation. He said the motor and our convertor are of very good quality,he known this. And analysis of our all stainless steel drum and shell and the high quality parts were the main selling point, motor, converter are good quality. Customers saw our coin-operated upper dryer and lower washer machine,and was very interested it, the biggest feature of this machine is it include the three functions of washing, extracting and drying, one machine and replace the normal standard two machines, and it is Maximized saving area. We show the machine’s testing to customer, the machine runs smoothly and stable,and low noise, the customer liked it very much. Customers informed that this machine would be very popular in their country. Finally decided to buy samples to test market demand before talking about agency.